Financial Independence In Your 30s – How Realistic Is It? Achieving financial independence in your 30s or 40s is possible, but it might not be as easy as some people make it out to be. Here are the real numbers for reaching financial independence early. Imagine having saved enough money that you don’t need to work; you can live on just the interest your investments return each year. If you’re smart, you could live this way indefinitely without drawing down your principal. This is financial independence. It’s something that most of us daydream about. Some of us hope to achieve it in our 60s. Now imagine achieving financial independence (FI) decades earlier: at 50, 40, or even in your thirties. Blogs and forums like Mr. Money Mustache, the teachings of one such 30-something retiree, provide inspiration and roadmaps for those working towards early financial independence (EFI). But how realistic is EFI? If you scrimp and save, could you actually quit your job in your 30s and expect to be financially secure for the rest of your life? Is EFI just a fantasy? In my profession — financial publishing — there is at least one universal truth: If I write about becoming a millionaire, starting an online business or retiring early, passionate readers will come in droves. If I write about 401(k)s and being “financially responsible” (yawn), I’m lucky to get a few people Googling the subject, who leave as soon as they get their answer. I fight this trend by publishing a bit of everything, because my goal is to provide all of the tools someone needs to become financially successful, not just escapist essays on the dream of quitting work at 35 and retreating to a white sand beach. Yes, some people can and do retire quite young. The problem, as I see it, is that an overwhelming majority of people who spend hours reading about early financial independence will never take the action they need to get there. To use my favorite analogy, EFI advice is like diet advice: Millions buy diet books every year, but only a small percentage of people successfully lose the weight. What’s your number? … The amount of money you would need to be able to walk away from it all and just live happily ever after. See, I find that everyone has a number, and it’s usually an exact number, so what is yours? The movie “Wall Street: Money Never Sleeps” was OK, but I love that quote. Because it’s true: Everybody has a number. Put simply, financial independence requires the accumulation of your number: enough capital to provide income for the rest of your life. On the surface, this might seem like an easy calculation. Let’s say you’re 30 years old, you expect to live to 90, and you’re content living on $50,000 a year. You need 60 years of income. Sixty times $50,000 is $3 million. Right? Well, not exactly, because we’re forgetting inflation. If we assume an average annual inflation rate of 3 percent, in 60 years you will need $286,000 to buy the same goods as $50,000 buys today. Yikes! So to live at today’s $50,000 standard of living for 60 years, you’ll need to save not $3 million but $8.1 million. That’s a big difference. This is why everyone needs to be an investor. Yes, there are risks. But inflation is a near certainty, and investing is the best chance you have of protecting the value of your savings (and hopefully growing it). So what happens if you take $3 million and invest it? If you invested $3 million over 60 years and earned a modest 4 percent annual return, you would end up with over $30 million. That’s the power of compounding for you. But if you’re going to live off that money, you’ll need to withdraw from your capital every year. Now let’s assume your money will grow at the same 4 percent average annual rate, but you withdraw $50,000 (adjusted for 3 percent inflation) once a year for the next 60 years. Not only is that possible, but you’ll still have $7.5 million remaining. The lesson? When you invest, you need to save less money than you might think to quit working and live a financially independent life. Using these numbers, $2.3 million would still get you to age 90 with about $100,000 left over. But here’s a remarkable fact: If you started with just $2.2 million — just $100,000 less — you would run out of money before the 60th year. Saving an extra $100K could be the difference between running out of money and leaving a small inheritance to your heirs. The above model is typical for retirees. It assumes needing your money to last for a fixed number of years. (If you’re 65, you might not know if you’ll live to 85 or 100, but you can say with some certainty you’ll be dead by 105). If you want to retire early, it’s a far better idea to plan to live off of just the interest and never deplete your principal — since it’s hard to tell how many years you’ll need the money to last. This is the method recommended by almost every financial independence blog I’ve read. In theory, it sounds amazing. Even the math is blissfully simple: Assuming a 4 percent withdrawal rate, you need 25 times your annual expenses in order to retire. Using this method, to retire with an income of $50,000 per year, you would need just $1.25 million. ($1.25 million × 4 percent = $50,000). The thinking under this scenario is that on average, over time, your investments will do slightly better than the 4 percent rate of withdrawal, and your capital will grow. Maybe. But here’s the problem: This ignores inflation! Under the standard interest-only model of EFI, you’re living on $50,000 in today’s dollars forever. In 60 years, that will be like living on $8,486 a year (assuming 3 percent average annual inflation). Earlier, I said that if you were willing to withdraw interest and capital, you could retire early on $2.3 million and cash out the equivalent of $50,000/year for 60 years. If you wanted to live on $2.3 million indefinitely using just the interest, you could only expect to withdraw the equivalent of $23,000 annually, not $50,000. This changes the EFI multiplier (the number you multiply by your desired annual income to achieve “your number” or savings goal). 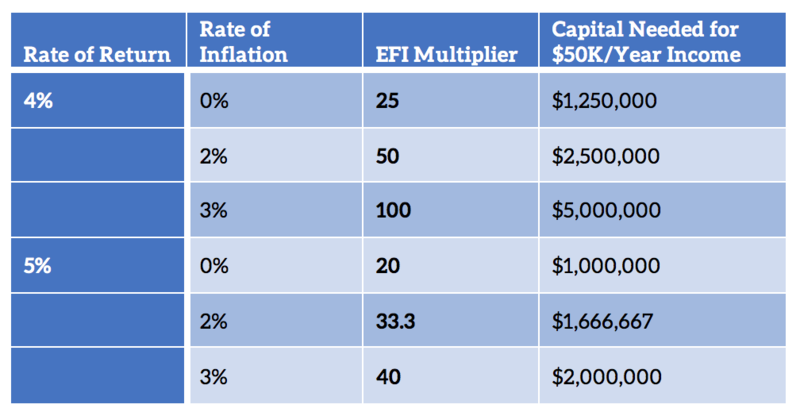 Using a 4 percent rate of return and 3 percent inflation, your EFI multiplier jumps from 25× to 66.6×. To earn the equivalent of $50,000 forever, withdrawing only interest, you would need to save $3.33 million. This reality can be discouraging, because saving 40 or 50 times your desired annual income is much more daunting than saving 25 times. But do keep in mind that this is the formula for infinite returns. And we’re not going to live forever. Earlier I gave the example that saving $3 million would let you live on $50,000 (adjusted for 3 percent inflation) for 60 years and you would still have $7.5 million left over. But $3 million is a lot less than the $5 million in the above chart. What gives? Again, it comes down to infinite returns. As it turns out, if you save $3 million dollars at 4 percent and withdraw $50,000 a year adjusted for 3 percent inflation, your capital will continue to grow for 63 years, at which point withdrawals will outpace earnings. At that rate, the money would last for a total of 90 years. So while the EFI multipliers required for infinite returns are interesting, you can probably retire just fine with far less. The takeaway, however, is that you should not count on withdrawing every penny of your earnings every year. The more you can leave invested, the better you will be able to weather inflation and market volatility. And the earlier you want to retire, the more important that “extra” becomes. On a spreadsheet, early financial independence is just a matter of saving enough money and earning the right return. But spreadsheets are tidy and life is messy. The stock market is volatile and we don’t always spend the same amount every year. This is why, not surprisingly, sites like Mr. Money Mustache talk mostly about living very, very frugal lifestyles. Unless you can accumulate significantly more capital than you need, managing your expenses is the only way to make EFI work given all the uncertainty. Which brings us to a reality check: How little are you willing to live on? I admire the frugality of many EFI bloggers, but I know that I couldn’t come close to their lifestyles. I’m just hardwired to enjoy certain things and be a bit more spendy, I guess. That increases my EFI timeline, but I’m OK with that. Achieving financial independence early — even in your thirties — is possible, yes, but it’s more complicated (and a bit riskier) than some people make it out to be. I don’t want to discourage anyone who is seriously working toward the goal! Every dollar you invest is future freedom.